For investors, the excitement is also palpable. That's because one of the stocks represented at the Masters this week could bring shareholders a 100% gain this year. Make no mistake: You won't be able to turn on the Masters this week and not see this stock's influence. As a big believer in behavioral psychology dictating investor actions, this week is going to be absolutely huge. And it's not just this week. The entire month of April is historically quite positive for investors. From 1950 to 2018, the market has gained 1.33% on average during the month of the Masters. That is significantly higher than what the market produces during other months. But the Masters this week will be the biggest catalyst for today's stock to buy. In a market that's fully priced across multiple sectors, it's rare to find opportunities like the stock that's in focus this week. Of course, the Money Morning Stock VQScore™ system scours the universe of publicly traded companies looking for just such opportunities – stocks that can double in value. 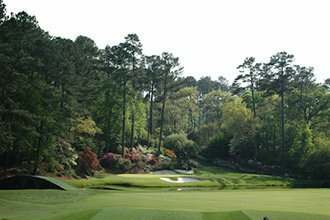 This week, we found one that everyone will be watching at the Masters. This stock has incredible potential, no matter who wins this week's tournament.